Martin Ivach likes to be on the straight and level with his customers who trust Green Ace Landscaping (Unilock Authorized Contractor) with their backyard dreams. It’s the foundation to his business, so to speak, as building a solid base for any backyard project is fundamental to creating a space that will provide a lifetime of enjoyment and memories for homeowners. “I drive around Oakville, Mississauga and the GTA and every now and then I go past a project that I worked on with my father 20 years ago and those stone driveways still look perfectly flat and in great shape,” Martin says as Green Ace Landscaping moves into Week Three at its current back and front yard landscape redesign on Brookside Avenue in south Oakville. It’s that kind of attention to detail and desire to create spaces that are as unique as they are long-lasting that elevates Martin and his team of skilled craftsmen to the cutting edge of pool and patio design. At this point, the project is 70% complete. The stone steps to a back entrance of the home and poolside garden beds are complete, the stone fire pit is nearly complete, what will be a magnificent water feature is well underway and a foundation of stone and gravel has been placed and leveled in preparation for the next phase. 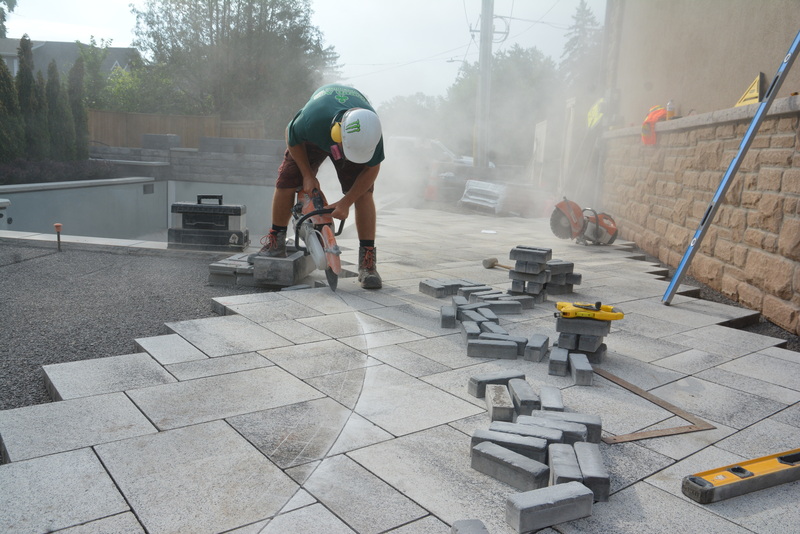 “Now that the backbreaking work is done, we get to bring the design to life as we lay the pavers and put the patterns together. Here’s where you get to use your math skills to get the angles and patterns to match. It’s like creating a masterpiece with Lego or puzzle pieces, but we use Unilock stone,” says Foreman, Chris Welbanks. Chris and his crew have just spent three full gruelling days in the summer heat lugging 20 yards of 5/8ths stone for a nine-inch base and eight yards of High Performance Bedding gravel for a one-inch grading layer, into the backyard to create the perfectly level foundation. On top, they’ll spend the next three to four days this week laying and cutting Unilock’s spectacular Umbriano Winter Marble stone pavers feature blue granite flashes that sparkle in the sunlight. 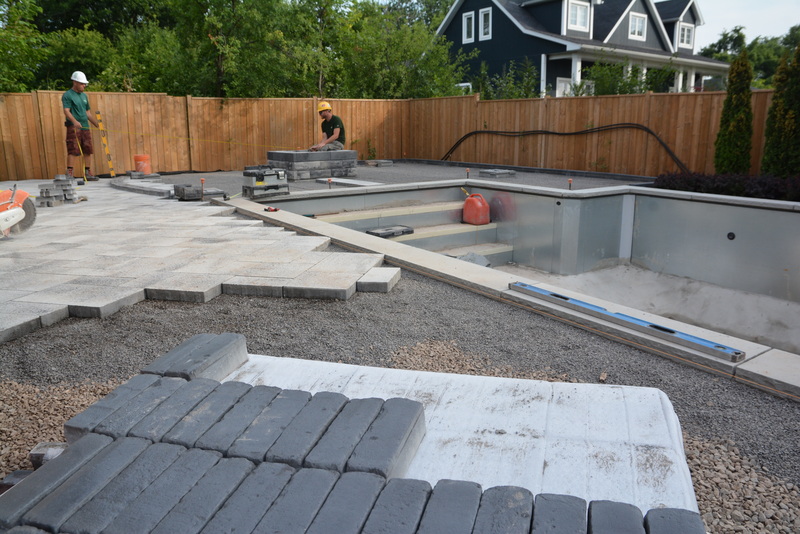 The main pavers are being installed on 45-degree angles - meaning a lot of cutting to make it all fit. A smaller Unilock stone will be intertwined as a triple basket weave border around the entire surface, while a circular pattern will be cut and inlaid in the main seating area using a third stone. “It is imperative that a homeowner plan their project and speak freely with their contractor/designer about their wants and needs,” says Carolyne Planck, the Toronto-area Territory Manager for Unilock. “A focal point for a project might be key such as; a golf green, a kid’s play area or a pool, and what will you be spending your time doing there? Some people plan as if they were going to be constantly entertaining, however that might be the case only a handful of times in a season, so you really need to make the space about you and your daily life and you won’t be disappointed. Once you have a focal point, a pool in this case, Carolyne suggests that homeowners may want to choose a paver that will highlight the area. “It is a mistake to say my house is grey I need a grey paver without giving full consideration to the full potential and feel of the project,” she adds. It’s wise to use more than one color and it is encouraged to use different textures and shapes. This will create interest, highlight a focal point or define an area or transition from one side of the house to the next. “It is a good idea to explore and then refine,” she says. “After all, this is another fabulous room – just outside the house. Have fun – hire the right contractor, one that collaborates with your ideas and intentions for a great outdoor living space. Pop by the Unilock Outdoor Idea Center where you'll find finished, life-like outdoor designs featuring our most popular products. Another outstanding feature of the Brookside Avenue project is the coolest part of it from Martin’s point of view. There’s going to be a water feature topped off by a pair of fire bowls that’s being created at the south end of the new 16x30 pool. 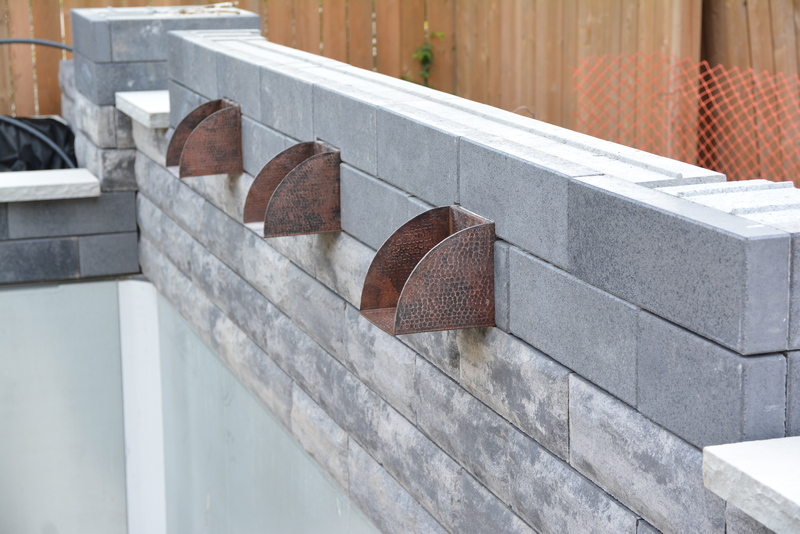 Aside from being the largest water feature Martin has ever built, it’s an artistic masterpiece crafted with Unilock’s stone that features three copper spouts that will return recirculated water back to the pool. We’ll talk more about that in the next update from Green Ace Landscaping and Unilock. They’re also landscaping the entire front and side yard of the corner lot including a new walkway to the front doors, stone flowerbeds and a Unilock stone driveway – don’t forget, they’re built to last a lifetime and longer.